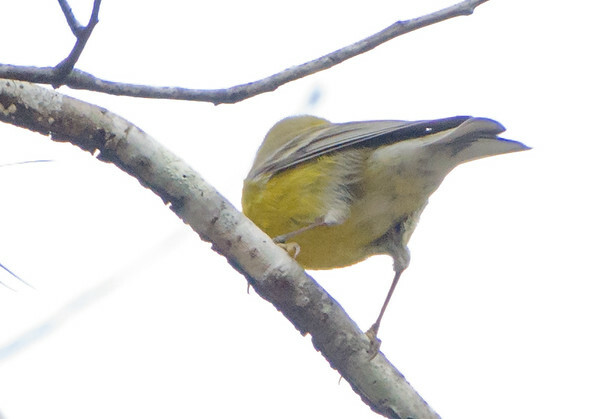 This rather blown out picture of a bird is a Pine Warbler. It was found on our birding trip to the Texas Gulf Coast back in December 2016. Unfortunately, I cannot remember exactly where this picture was taken beyond the Texas Gulf Coast. When this happens, I usually trace back through the picture catalog until I recognize a location and then walk it back to pinpoint where I was at. I cannot take the time to do that, so you will just have to accept it was somewhere in that large swath of birding paradise (If I had to guess, I’d say it was in Conroy Texas at the W.G. Jones State Forest – will track that down for sure and update the post). There are lot of yellow birds around the US which can make it difficult to distinguish in the field. These Pines have a pale eye ring that is pierced with a black line. The other key feature is the strong white barring on their wings and the deep notch in their tail feathers. You probably already noticed the chest is full on yellow and then fades into white as it travels back to the tail slot. Looks like I do have a shot of that (with echoes of Ron reminding to always get different angles). And there you have an equally overblown shot showing the transition to white which starts around where the legs join the body. You can also see that deep slot in the tail feathers from this angle. Since this is a new bird, how about some quick facts. First off, these are fairly hard birds to get in the tin unless you can get a decent view of the tree canopy. They tend to stay out of sight as they forage the upper parts of trees looking for tasty insects and seeds. Although I do not think the branch this specimen is sitting on is a pine tree, they are aptly named for their preference to hang out in those types of trees. They pretty much an eastern half of the US bird coming down to enjoy the Gulf Coast during the non-breeding season. 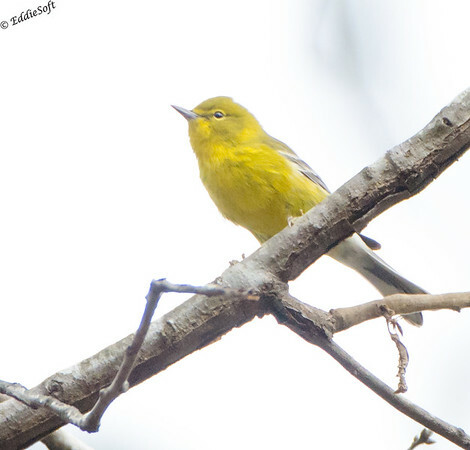 The Pine Warbler is the only Warbler that eats large amounts of pine seeds (actually according to Cornell, this is one of the few Warblers that each large quantities of any seeds). That looks like the sum total of interesting things I can share. Probably a good thing seeing as how my time is about up for this month. It’s been a busy month and looking forward to what October will bring. If nothing else, I will definitely make every effort to get posts done earlier in the month and more importantly, get caught up on all the numerous posts from my blogger friends!